Everyone accumulates junk from time to time. Whether you've accumulated junk in your home, office or business, EZ Restoration LLC offers junk removal services to residential and commercial clients. EZ Restoration LLC will remove junk from your attic, basement, garage, or anywhere else in your home. Maybe you're a hoarder or has a family member who's a hoarder and finally need that junk removed. Or maybe it's a foreclosed property and the homeowners didn't bother to remove their debris. 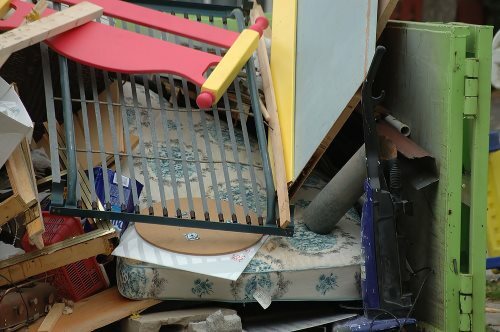 No matter how small or large of a junk pile you've accumulated, EZ Restoration LLC has the equipment and manpower to get your job done in no time. Small office or a large business, small knick-knacks or large furniture, EZ Restoration LLC has the capabilities of cleaning out your commercial property and have it junk free at a very affordable rate. Whether residential or commercial, EZ Restoration LLC will pick up all the unwanted junk and haul it away for you, allowing you to focus on other things. Having been in business since 2013, know that you can trust EZ Restoration LLC for ALL your residential or commercial junk removal needs. Call us at (844) 289-7209 for your free estimate today.